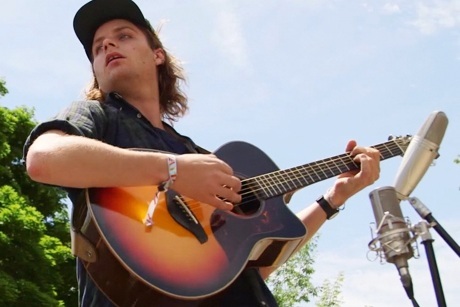 Mac DeMarco is very quickly growing beyond his Salad Days. Not only has that album garnered critical attention, but the singer also has a fan-drawn 7-inch contest, his own documentary, a videogame and, most recently, was mentioned on the Polaris Music Prize long list. Just a day prior to his Yonge-Dundas Square performance at NXNE, the rising star stopped by the Exclaim! office to perform a live take of "Salad Days" for Exclaim! TV. The eccentric singer played atop two of our newspaper boxes and preceded the song with some wholly random remarks, but didn't let his goofy demeanour slip into the quality of his playing. Watch as he bobs around to the titular track from his latest LP below. DeMarco has a handful of Canadian tour dates left on his North American tour. See if he plays a show near you by checking out his list of dates below, but not before watching "Salad Days" at the bottom of the page.